Seals, cliff divers, Great Danes and hiking are simple ingredients for the best day trip from Dublin. Howth, Ireland, had me swooning the second I exited the train. It was a sunny January day (talk about luck!) in this charming little Irish village, an easy 30 minutes from Connolly Station in Dublin. As we approached the harbor, it didn’t take long before I noticed a little seal head bobbing about the boats. My eyes lit up, a cheesy smile took over my face and I began this awkward skip-prance-jog-remember-you’re-an-adult-but-hurry-up-and-get-to-the-seals mixture of movements. At first I watched the little marine-life magicians quickly vanish into the cloudy sea and immediately reappear on the very opposite end of the harbor, over and over again. But then a fishing boat docked and the real show began. The fishermen began throwing the unwanted catches back into the sea and suddenly there were countless seals fighting for the food, posing for pictures and displaying their playful personalities. I’m an animal-loving lunatic—especially for sea creatures. I could have easily spent my entire day taking pictures of and ogling over these frisky little fellows. But after about an hour and a half, we decided to move on—and it’s a good thing we did. We began the beautiful hike up to Howth Head, admiring the quaint little cottages and brightly colored doors along the way. As we approached the top, stunning cliffs surrounded us. In the distance, we spotted some extreme cliff divers jumping and flipping into the frozen sea. We oohed and ahhed for several minutes and then continued to move along the trail. The trail never ended, and neither did the stunning views of the ocean, but we finally decided it was time to turn back. On our way back down, we saw a small shack selling snacks and drinks (say that five times fast!). Of course, the food isn’t what caught my eye, but rather the two Great Danes guarding the property. We had to stop. Plus, tea sounded really good. We drank tea, chatted with the owner and loved on his curious (and abnormally large) pups. It was in this moment I realized I was experiencing the Ireland I had always dreamed of. Finally, the sun began to set, so we said our goodbyes and headed back to the harbor to catch the last train back to Dublin. 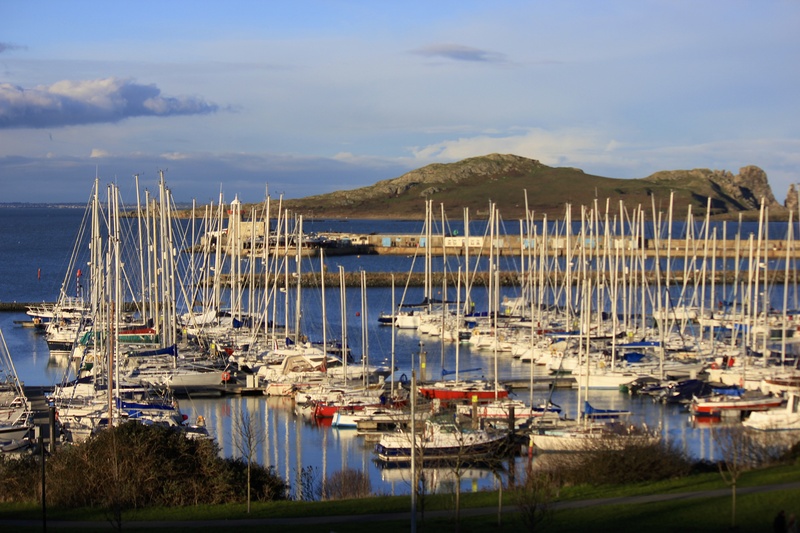 Although we only had a three-day weekend in Dublin, Howth was the ideal day trip for us and I’m so thankful we decided to spend a day away from the city. I really felt that we experienced a side to Ireland that you can’t find in the capital–e.g. wild seals! From Connolly Station, hop on the DART heading north to Howth. A roundtrip ticket is only €4.70 and it’s only a quick 20-30 minute ride. Pack or buy sandwiches to eat while hiking Howth Head. Don’t forget water! I’m unsure of the name, but stop for hot tea or coffee at the little shack near the top of Howth Head. You can also buy snacks here and play with Great Danes! Howth offers some amazing, fresh seafood. If you’d like to indulge in a fancy dinner, consider Oar House or Aqua who feature the catch of the day and other locally sourced ingredients. Comfortable walking shoes. And bring rain gear because, well, it’s Ireland. Howth Head, the cemetery in the middle of the peninsula, the seals in the harbor.